Springfield Armory's XD(m) and XD pistols are acclaimed for their superior balance, reliability and ergonomics. 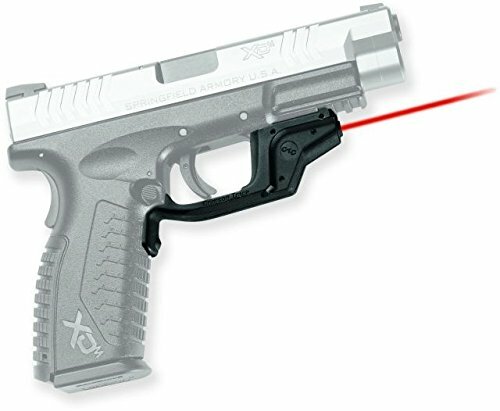 Crimson Trace is pleased to release laser sights for XD(m) and XD pistols. The LG-448 Laserguard is designed to fit both lines in all sizes and calibers. Featuring Instinctive Activation, the laser sight immediately springs to life when held in a normal firing grip. Attaching firmly to the trigger guard and balanced against the accessory rail notch, the LG-448 can be zeroed by the user to their individual firearm (both windage and elevation) and has been rigorously tested to hold zero under the most demanding field conditions. POWERFUL RED LASER: Features a 5mW peak, 620-670nm, Class 3R visible red laser - the brighest beam allowed by law. INSTINCTIVE ACTIVATION: Front activation button engages the laser immediately when the firearm is held in a normal firing grip. This is the feature that sets Crimson Trace apart from the rest. OVER FOUR HOURS OF BATTERY LIFE: Powered by one 1/3N Battery (included). This product is eligible for Crimson Trace's Free Batteries For Life Program. EASY INSTALLATION: User installed- no gunsmithing required. Factory sighted at 50 feet, but is fully user adjustable for Windage and Elevation with provided tool.